Elections 2019: Will SP-BSP alliance maths trump Modi's chemistry in UP? 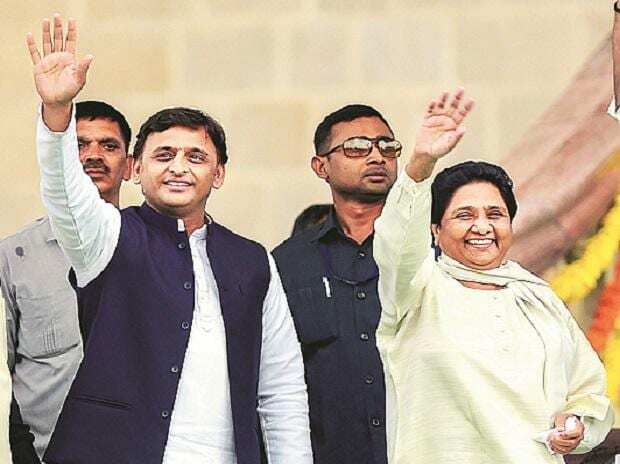 The Samajwadi Party (SP) and Bahujan Samaj Party (BSP) seem to have snubbed the Congress by keeping it out of their putative grand alliance for the 80 Lok Sabha seats of Uttar Pradesh. However, leaders in the Congress and the SP say the Opposition parties are working on a plan to defeat the Bharatiya Janata Party (BJP). SP President Akhilesh Yadav and BSP chief Mayawati met in New Delhi on Friday evening to seal a deal. The two parties will contest 37 seats each. Ajit Singh-led Rashtriya Lok Dal will contest three seats — Kairana, Mathura, and Baghpat. One seat will go to the Nishad Party. The alliance will not field any candidates on Gandhi family pocket — Amethi and Rae Bareli. The SP-BSP alliance keeping out the Congress could adversely affect leaders close to Rahul Gandhi, such as Jitin Prasada, R P N Singh, Nirmal Khatri, P L Puniya, and Annu Tandon. They had all won in the 2009 Lok Sabha polls. Congress leaders, however, claim this was a plan, and after analysing the results in Chhattisgarh, Madhya Pradesh (MP) and Rajasthan, they had arrived at the decision that a pre-poll alliance with the BSP might actually hurt its chances. According to the Election Commission data, the BSP’s core Dalit vote base had been eroded over successive elections in Rajasthan and MP. In 2008, the BSP had won seven seats in MP; it went down to four in 2013, and two in 2018. Its vote share declined from 8.97 per cent in 2008 to 5 per cent. In Rajasthan, the BSP vote share has increased by 0.63 per cent to 4 per cent in 2018 from 3.37 per cent in 2013, but is much lower than the 7.6 per cent in 2008. The Congress analysis also reveals that the BSP hurt the BJP in more seats than the Congress in these two states. The BSP’s alliance with Ajit Jogi’s Janata Congress Chhattisgarh benefitted the former more than the latter. An SP-BSP alliance would better consolidate the Dalit-Other Backward Classes vote in UP, claim Congress strategists. The Congress can eat into the BJP’s upper-caste vote bank, thus helping the alliance beat the BJP in more seats. A pre-poll alliance with BSP could hurt the Congress’s support base among upper-castes, OBCs, and the aspirational urban voters, especially if the BSP performs well in 2019 and Mayawati emerges as a prime ministerial candidate. The party is apprehensive the BJP will exploit this. Two reasons have prompted a change in the Congress’s attitude: First, it feels that its good performance in Chhattisgarh, Madhya Pradesh and Rajasthan was helped by urban voters as well as OBCs having shifted their loyalties. Second, is its disastrous alliance with the SP in 2017 UP Assembly elections. For the seats where the Congress hopes to win in UP, a “Jangipur model” is being explored. The SP-BSP is being persuaded to field weak candidates in these seats. The model refers to the 2004 Lok Sabha polls for the Jangipur seat in West Bengal, where the Trinamool Congress and Communist Party of India (Marxist) fielded weak candidates to help Pranab Mukherjee of the Congress. The Congress also believes that in the Hindi heartland outside UP and Bihar, it and the BJP will be key players. The BSP’s vote share is bound to go down. The party wants to regain its upper caste vote base.